Players pick their own teams (and team names as well). Preferred format is 3v3. A maximum of 4 players per team. Format will be determined by event director before the small-sided games begin based on the number of players available. Teams may be co-ed. And, players may be from different age groups as well. NO coaching, unless you are playing! May be taken in any direction. As the kick off is an indirect kick, you cannot score directly from a kick off. The ball must be 100% over the mid-line to be considered on the offensive half of the field. The ball shall be kicked into play from the sideline, rather than thrown in. The ball is considered in play when the ball is touched and changes position. This is an indirect kick, and a goal cannot be scored from a kick-in. May be taken from any point of the end line or goalie box. All Goal Kicks are indirect kicks. In fact, ALL restarts are indirect kicks. NO direct free kicks. In all dead-ball situations, defending players must stand at least five yards away from the ball. If the defensive player’s goal is closer than five yards, the ball shall be played five yards from the goal box in line with the direction of play prior to the penalty. 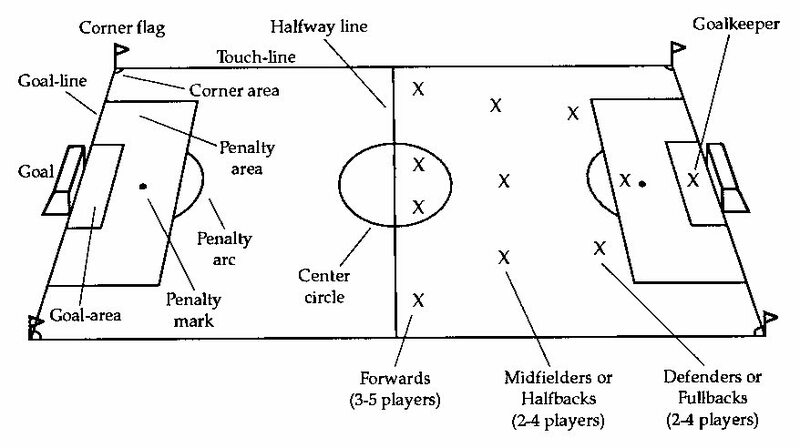 A goal may only be scored from a touch (offensive or defensive) within the team’s offensive half on the field. The ball must be completely on the offensive half of the field, and cannot be touching the mid-line (Example: kick-off). If a player in their defensive half kicks the ball across the midline and the ball hits another player (offensive or defensive) in their offensive half, and the ball goes in the goal, a goal will be awarded. If a ball is kicked from the defensive half and is not touched before the ball rests in the goal, a goal kick is awarded to the defensive team. A goal cannot be scored from an indirect kick, such as a kick-in from out-of-bounds. If real goals are not available, cones may be used. We do NOT play offsides during small sided games. If a player is sliding for the ball, contact with any player(s) from the other team is NOT ALLOWED. If a player slides and contact is initiated, a free kick shall be awarded. This does not prevent players from sliding to stop/ intercept a ball where contact is not initiated during the slide. Example: a player may slide to save a ball from going out-of-bounds (even though a pull-back is preferred). There are NO corner kicks,… everything past then 'end line' results in a goal kick. There is NO ball contact allowed within the goal box; however, all players may pass through the goal box as long as they do not touch the ball while in the box. Any part of the ball or player’s body on the line or inside the plane of the box is considered in the goal box and an extension of such. If the ball comes to a rest in the goal box, or on the goal box line, a goal kick is awarded regardless of who touched the ball last. If a defensive player touches the ball after it has entered the goal box, the plane of the goal box, or an extension of the goal box (such as any part of the ball or player’s body on the line or inside the plane of the box), a goal will be awarded to the offensive team. If an offensive player touches the ball after it has entered the goal box, the plane of the goal box, or an extension of the goal box (such as any part of the ball or player’s body on the line or inside the plane of the box), a goal kick will be awarded to the defensive team, and a goal will not be counted if scored. The plane of the goal box extends upward infinitely. No limit to the amount of substitutions a team can make. Substitutions can be 'on the fly', any time during the game, even when the ball is live. While players must leave the field of play before being replaced, substitutions must be made at the midfield like. Any 'nutmegged' player must sit out until the next goal is scored. Three points for a win, one point for a tie, plus one point for each goal scored. Any team not knowing their score after the match will result in NO points being given to them. Two teams with the most points make it to the final.... winner earns the right to take on the coaches! All disputes are settled using 'Rock, Paper, Scissors'.